Antofagasta Minerals is a mining giant that runs the Pelambres open-cast copper mine in Chile. For almost a decade, the community of Caimanes in northern Chile have argued that the company has deprived them of a vital resource and fundamental human right: water. 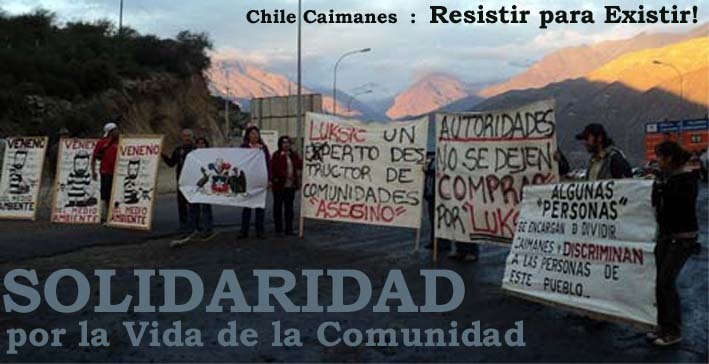 Chile’s Supreme Court ruled in favour of the people of Caimanes, demanding the Pelambres copper mine demolish the Mauro tailings dam, which the community blames for diverting the natural course of the Pupío estuary. However, Antofagasta Minerals, through different legal strategies refuses to comply with the Supreme Court order. In order to meet the energy needs of the Pelambres mine a hydroelectric project, Alto Maipo, also owned by Antofagasta Minerals (40%) was planned in 2007 and is currently under construction. The community of Cajón del Maipo claims the project endangers the irrigation waters for agriculture and accelerates the melting of glaciers and recharging of aquifers which will leave behind almost 400 square miles of barren land. The project threatens the safe supply of drinking water to 7 million people in Santiago and will do irreversible and long lasting damage to communities and the environment. The community resistance is recognised as one of the most significant stands against mining companies in Chile. Join two of their leaders to hear about the latest efforts in defence of their rivers, their crops and their livelihoods. If you would like to attend this event, or for more information, please contact amy.penfield@sas.ac.uk. Patricio Bustamante is an archeo-astronomist and one of the most important researchers on the Inca occupation in Collasuyu (Chena pucara – or eventually huaca – in Chile). About a decade ago, he denounced the loss of important archaeological pieces that occurred with the construction of the Antofagasta Minerals’ Los Pelambres mining project. Since then he has been working with Caimanes community to denounce human rights violations such as threats to life, security, lack of water and corruption. Patricio has given talks at several Universities around the world denouncing the atrocities committed by mining projects in Chile. Mella Marcela Ortiz is a teacher, mother of 2 daughters, and Chairwoman of the Citizen Coordination of “NO Alto Maipo.” She has been part of the organisation since its founding in 2007 and is a member of the Cajon del Maipo community, which she has represented in resistance to the Alto Maipo project. She has organised and participated in marches and other activities related to social mobilisation against Alto Maipo and Minera Los Pelambres in Santiago and in the northern regions. The tour has been co-organised with War on Want and Movimiento Jaguar Despierto.